A great way to alleviate daily stresses, these eye pillows are soft to touch and the contoured shape fits perfectly on every face. You can choose between silk or cotton fabric for your eye pillow. Our crescent shaped eye pillow is filled with organic flax seeds, which create gentle pressure around your eyes to alleviate pain. The eye pillow is adaptable to fulfill your requirements. Lightly scented with lavender, you can adapt the scent to suit your liking. The removable pouch has a zipper, which you can open to add scent using lavender oils or fresh lavender. 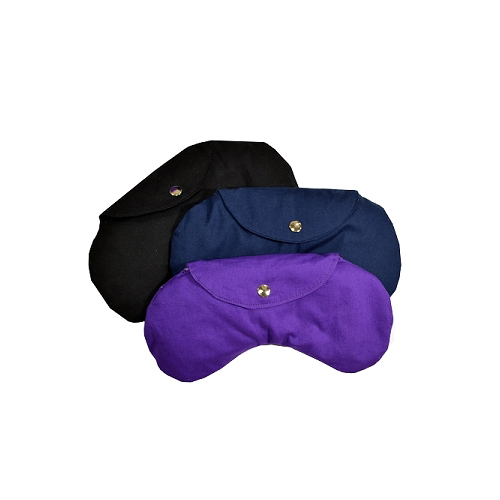 Affordable and durable, this adaptable eye pillow is the perfect gift for your yogini friends and family. Available in three different colours to suit everyone! Filled with organic flax seeds, not plastic beans! Relax your mind and soothe yourself into meditation with these lightly scented crescent eye pillows. Lavender scented, you can choose from silk or cotton fabric for these versatile eye pillows. The eye pillows arrived a couple of days ago and look and smell lovely, I bought one for myself and the others are gifts. I can't comment on use yet but I'm sure my friends will be delighted - they look like a quality item and the carrying pouch is a nice touch. THESE WELL MADE EYE PILLOWS WERE WELL RECEIVED BY MY YOGA STUDENTS AND WERE LIGHTLY SCENTED WHICH SUITED SOME BUT NOT ALL. HOWEVER, AS THERE IS A ZIP ON THE INSIDE POUCH MORE SCENT CAN BE ADDED IN THE FORM OF LAVENDER ESSENTIAL OIL OR FRESH LAVENDER. ALSO IF THE MASK FEELS TOO HEAVY THE ZIP ALLOWS SEEDS TO BE REMOVED. SO ALL OPTIONS CATERED FOR AT A VERY REASONABLE PRICE. This eye pillow is an ideal shape to gently rest over your eyes to block out the light during a breathing or relaxation practice. I'm a yoga teacher and gave these as a gift to my students in celebration of their 10th class attendance. Smiles all around! Just bought another five - excellent value, and a super product. Really pleased with these- feel like luxury ?? My order arrived extremely quick and was even better than I imagined. All individually wrapped. I order cotton and the quality of the material is brilliant. Very well sewn and they smell wonderful! Can't wait to give these to my students. Will be ordering more in the future for gifts. Such a great price! I bought 3 dozen of these as they were on sale, as a thank you present for my students. The shape is great and they are well made, with a lot of contoured stitching and two concealed zips so you can remove the outer cover for washing and adjust/top up the flax seed filling. However, the picture shows a navy blue but the ones I received are bright turquoise/acqua and I'm pretty sure the material is a synthetic sateen rather silk, as it is not soft or cool to the touch. Apart from these two minor points, I'm happy with the purchase at the sale price but would have complained at the full price.